Home / Posts Tagged "Northern Banking Company"
The Belfast News Letter of 15th December 1914 reported in the war series “Ulster and the War – Bank Clerks in the Army”. Within the first few months of war being declared, over 100 bank clerks or workers had volunteered for service or had been ‘called up’ due to being in the Army Reserve. Private Michael Millett from the Bank of Ireland was probably the first bank official to be killed in action. Millett was born around 1886 in Kilcloney, Co. Roscommon and was the son of Colour Sergeant James Millett. He would have joined the Bank of Ireland around 1902. Soon after, he enlisted in Athlone into the Army Reserve. At the outbreak of war he was immediately called up to serve in the 2nd Bn. Prince of Wales’s Leinster Regiment (Royal Canadians). After training, he was sent to France with the British Expeditionary Force. He was Killed in Action on 20th October 1914 aged 28. Millett is remembered on the Ploegsteert Memorial, Comines-Warneton, Hainaut, Belgium and on the Bank of Ireland War Memorial in College Green, Dublin. Sergeant William Archibald Pattenden from the Northern Banking Company was to be Killed in Action at Ypres on 31st October 1914. Pattenden was born in October 1886 in Flimwell, Tunbridge, Kent, England and was Church of England faith. He was the son of Horace Pattenden and had 2 older brothers, George and Frank. In September 1906, following his education, Pattenden volunteered and enlisted in the Royal Sussex Regiment at Chichester, England. On his enlistment form, his next of kin is recorded as his father and the 2 elder brothers. Their address is recorded as East Street, Hambleden, Kent, England. He was given the Service Number of 8527. William is described as being 5 foot 6 inches tall and weighing 141 lbs (10 st 1 lb) with a scar over his left eye. He has dark brown hair, brown eyes and a fresh complexion. Pattenden’s military career started off at the Depot, Royal Sussex Regiment. In 1907 he was posted to the 2nd Battalion. Later that year he was posted to the 1st Battalion. Between October 1907 and December 1913 Pattenden was serving in India (Ambular, Rawalpindi, Gharial and Peshawar). He transferred to the Army Reserve in December 1913. According to the Army ‘Statement of Services, Pattenden was formally discharged from the Army Reserve on 30th September 1914. Over the years in service, his army medical form records him suffering from tonsillitis, having an abrasion on his left arm, having an abscess. In 1913 at Rawalpindi, India he was vaccinated as a result of having ‘vesicles’. On his transfer to the Army Reserve, he was found to have a hernia. Sometime after 1913 he moved to Belfast and joined the Northern Banking Company as a Head Office Porter and Caretaker. He was married and living in 13 Third Avenue, Belfast. At the outbreak of war, as a Reservist, Pattenden was immediately recalled to the 2nd Bn. Royal Sussex Regiment. The battalion immediately went to France as part of the British Expeditionary Force. He was to be Killed in Action at Ypres on 31st October 1914. He was also the first Northern Bank official to take part in the Great War. He is commemorated on the Ypres (Menin Gate) Memorial, the Shankill Road Mission War Memorial and on the Northern Banking Company War Memorial in Donegall Square West, Belfast. Moira Hero Captain William James Lyness MC** was one of only 168 men in the British Army to receive three Military Crosses in the First World War. 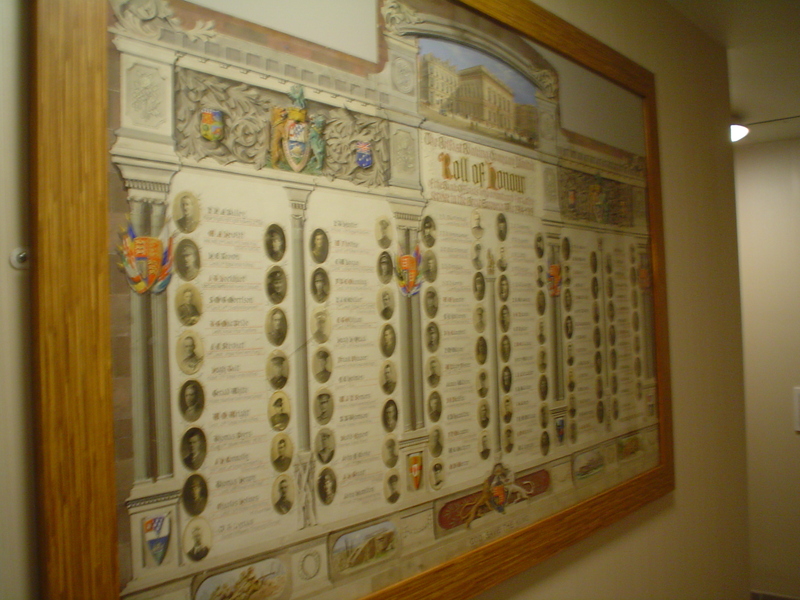 Around 200 bank officials from the Northern Banking Company and the Belfast Banking Company served in the Great War. 15% of them died during the conflict. Amongst those bank officials who volunteered and served was Tullyard man, Captain William James Lyness. He was the son of William John Lyness and Frances Mary Lyness from Tullyard, Moira, Co. Down. Lyness worked in the College Green, Dublin branch of the Belfast Banking Company prior to his enlistment as a cadet in Colonel Shannon-Crawford’s battalion. He then went on to serve with the Royal Irish Fusiliers and attained the rank of Temporary Lieutenant (1916), Captain and Adjutant (1918). He saw action at Messines, Langemark, Cambrai and the Somme (1918). During his military career Lyness was awarded 3 Military Crosses and the Croix de Guerre. Only 168 men received 3 Military Crosses during World War One, a testament to how brave Captain Lyness was. The Lyness family still reside at Tullyard, Moira. In December 1914 the Military Cross was instituted to recognise “distinguished services in times of war of Officers of certain ranks in Our Army”. The majority of Military Crosses were awarded for gallantry, but the decoration could also be granted for “distinguished and meritorious service”. The French Croix de Guerre was either awarded as an individual or unit award to those soldiers who distinguished themselves by acts of heroism involving combat with the enemy.